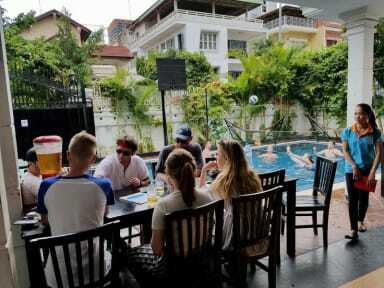 Lovely Jubbly Villa, a boutique hostel designed with the backpacker in mind, is the newest expansion of a Cambodian. We renovated a beautiful Cambodian style villa conveniently located in the city center, added a large swimming pool and look forward to welcoming you to a relaxing tropical garden atmosphere in the middle of this amazing urban jungle. We cater to backpackers of all ages and budgets and offer 4-bed to 20-bed dorms and private rooms. With free high speed WiFi and outlets next to every bunk, even the most tech savvy flashpacker or digital nomad will feel right at home. 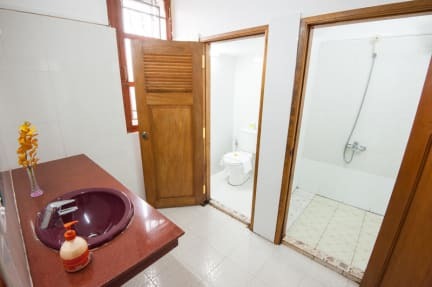 The primary goal of our hostel is to provide world class hospitality while at the same time equipping the next generation of Cambodians with the professional skills, competitive wages and language learning training that provide them with future professional opportunities they otherwise might not have. Our staff are ambitious and enjoy interacting with backpackers from around the world. So, if you are looking for a genuine cultural experience, you've found your hostel in Phnom Penh. Want to chill? Want to party? Want to meet other travelers? Lovely Jubbly Villa will meet all of your needs. You can play basketball/volleyball in the pool or relax and chat over a few drinks on the sun deck. In the media room, you can watch the latest DVD releases on a large flatscreen TV, listen to music. Feeling competitive? Challenge your new mates to a game of pool in the veranda or grab a cheap, but tasty drink and play some cards or Jenga at the bar. Hungry? We've got you covered with delicious Western and Asian meals at budget prices. We also offer free Tuk Tuk rides from the bus and boat station​​​ depot that form 8:00 am to 5:00 pm except Giant Ibis, ​Kumho Samco Buslines, Paramoun, Rith Mony, and Night Bus and can arrange transportation from the airport for $9 Tuk Tuk/$15 Taxi. We are located at No. 45 Street 222 (Sangkat Boeng Raing, Khan Daun Penh) and are conveniently located in the center of the city directly behind the India embassy. It’s a short walk to the riverfront, Royal Palace, Central Market, Independence Monument, and Chinatown. We are less than two blocks from Eclipse Skybar, which has the best view of the city and 6 blocks from the popular nightlife on Street #51. WiFi - We have five high-speed routers providing maximum coverage in all of our common areas. Media Room - Flat screen TV, Movie nights, cable TV, movie on request with over 200 DVD's, and comfortable couches. Hours: 7am-12am. Book Exchange - leave a book/take a book.